It was Dr Samuel Johnson who said “when a man is tired of London, he is tired of life; for there is in London all that life can afford.” The many writers and poets who have written about London on the whole have agreed with his statement. This literary anthology features a collection of poems and scenes from novels which range from the 15th century to the present day. For many who enter the capital with no guide or friend, it is the sheer crush of people which highlight their feelings of loneliness. This is especially so if you stand out from the crowd, new Black Londoners, James Berry and Samuel Selvon illustrate these feelings of alienation in post war London. London has always had a wide disparity of wealth and the book considers the ‘High Life’ with excerpts from Vanity Fair, The Way We Live Now and Vile Bodies. Many of these novels are concerned about fitting into the higher levels of British Society, where background and manners are the prerequisites for acceptance. In contrast , the section into the ‘Low Life’ explores the dark sides of London life where the fight for survival leads to the hidden depths of human existence. Not surprising Charles Dickens is our greatest guide with an excerpt from Bleak House. Virginia Woolf, Robert Louis Stevenson and Arthur Morrison also provide evidence from the dingy streets and alleys. Even from its earliest days, London has been a multicultural city and the section named Living Together in London explores how waves of immigrants have made the city their home and left their impact in the many of the capital’s neighbourhoods. Hanif Kureishi, Israel Zangwill and Zadie Smith gives voice to various communities who struggled to make the city their own. If the integration of the many immigrants has not been seamless, it is remarkable that for most of the time this integration usually takes place without major problems. London may inspire Hymns and Laments in equal measure but it is the capital’s ability to overcome the various disasters that have provided many writers with inspiration. The chapter entitled Survival through Plague and Fire charts the two great calamities of the 17th century, the Great Fire of London of 1666 and the visitation of the Plague. John Dryden recalls in verse, the Great Fire out of control , ” the flames impelled soon left their foes behind; and forward with a wanton fury went.” Daniel Defoe offers some scenes from an altogether different unseen threat, the plague decimated London but Defoe offers the humourous story of a piper who after a nights drinking is lying on the street and is thrown onto the dead cart to be taken away for burial. Fortunately he wakes up time but not without frightening the life out of the bearers carrying the dead. In the twentieth century, the threat to London was even greater, with the two World Wars and poets D H Lawrence, Robert Bridges and Mervyn Peake describe a city and country on the brink of the abyss. In the Second World War especially , for many Londoners it must have seemed that the City was witnessing Visions of the Apocalypse and some writers used this precept as the theme for their novels, Richard Jeffries in ‘After London’ and H G Wells in ‘The War of the Worlds’ offers visions of London as a deserted city finally beaten into submission. The reality is that whatever the challenges over the past two thousand years, London has survived and is ever-changing, the chapter taking up this theme includes the works of Tobias Smollett, Charles Dickens, John Galsworthy and Angela Carter. This ending is rather apt because literature is part of the fabric of London life, we are constantly being reminded of writers and poets descriptions of the city. Many people follow in the footsteps of the great writers both literally and metaphorically as they seek to find some understanding of London life. 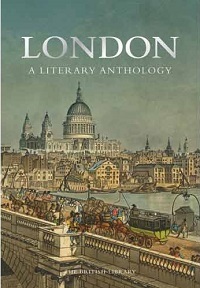 This anthology is a combination of well-known texts and others that may be less familiar gives an intriguing balance that offer many insights into the London story. The texts are complimented by the illuminating illustrations of London life taken from the British Libraries large collection. There are a number of anthologies on the market but this book offers more than most with interesting narratives, wonderful illustrations and attractive design. This anthology would appeal to those who like to understand the connection between the city and literature, but also can be used as an introduction into this fascinating subject matter. London Visitors is the official blog for the Visiting London Guide.com website. The website was developed to bring practical advice and latest up to date news and reviews of events in London. By londonvisitors2014 in London Book Review - Non Fiction on October 23, 2014 .